Tidy, pre-packed, wheeled, plenty of room. GREAT, you’ve blocked off the time, rounded up your friends and spent some money on a fishing trip. When it’s time to get packed, just a little extra effort will make your life a whole lot easier before and during the trip. Give these ideas a try the next time around! 1. Ditch your rod tubes. Yes, those aluminum rods tubes that came with your rods are pretty much bomb-proof. You could throw them in your suitcase and you wouldn’t have to worry at all about damage to your rods. The problem? They’re also heavy, unwieldy and often totally unnecessary. Lots of modern angling luggage provides a very safe place for rods just folded up in their ‘socks’. 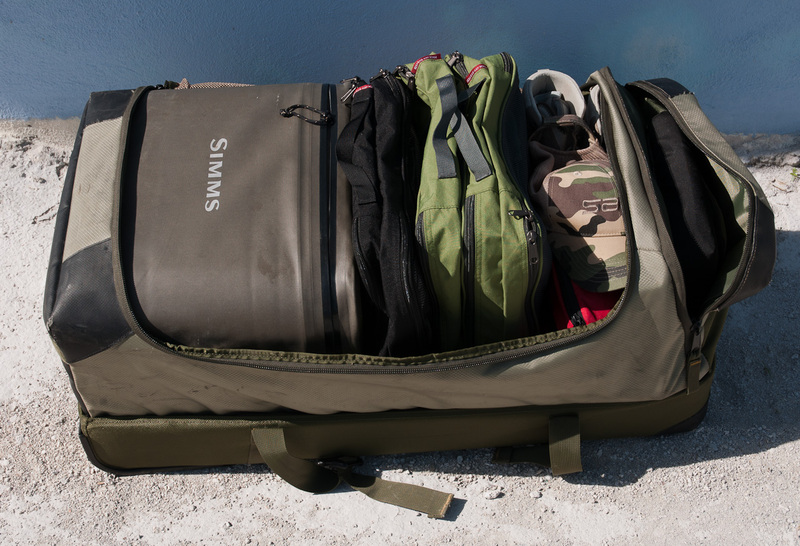 Bags like the Sage DXL Rolling Duffel have a stiff bottom compartment that’s perfect for ‘loose’ 4-piece rods, and still has plenty of room for fleece, waders, shirts…pretty much anything else that’s soft and bulky. As a bonus, that bulky stuff helps to pad your rods inside the big bag. 2. Use packing organizers. Most fishing trips involve multiple stops. You might hit 3 motels in Montana in a week. You might overnight in Anchorage on the way to the lodge. Any time you’re going to be in and out of your luggage, packing organizers like the Eagle Creek Pack-It system keep you, well, organized, and avoid the ‘sea of gear in a giant bag’ syndrome. They weigh almost nothing, and you’ll be amazed at how much more space you have in your bag by keeping things folded and packed in a little more orderly fashion. No more digging through your bottomless duffel in the morning – just unzip the ‘clean boxers’ pouch and you’re off! 3. Pre-pack your boat bag. Prior to your trip, think hard about what you’re going to need when you’re out on the water. Pack your boat bag accordingly, at home, before you leave. Organizing your boat bag on the first night of your trip is a pretty bad idea. Loading your boat bag at home makes it a lot more likely that you remember every last little gadget, and besides, you don’t really want to spend the first night of the trip alone in your room organizing fly boxes, do you? 4. Know what they’ve got where you’re going. Can you do laundry at the lodge? Do they have loaner waders? Is your fly shop host bringing extra rods in case you break one? Is your buddy bringing the cooler? Do they have your favorite scotch behind the bar? Getting these kinds of questions answered will keep you from over-packing. Really, you and your 5 buddies don’t all need to bring a spare 8 weight. 5. Go for wheels or backpacks. It might not be that far from your car to the check-in counter, and the rolling duffel bag may cost a little more, but we angler types are expert at packing 50 pound bags. 50 pound bags slung over one shoulder are very bad for your back. Make it just a little easier on yourself – go for the rolling bag, or at the very least go for the backpack and use both straps.